For centuries, the Pyramids and Great Sphinx have been the visible reminders of the power and enduring legacy of ancient Egypt. Mysterious and irresistible to the eye, these monumental structures—over eighty of which remain, scattered along the west bank of the Nile—evoke the religious system and beliefs of one of the most highly refined and evolved of ancient civilizations. Even today, we don’t entirely understand how they were constructed and what techniques were used, but the most recent research and excavations have thrown new light on life at the building sites and on the daily existence of generations of designers and craftsmen who dedicated their lives to these immense constructions. Replete with full-color photographs and drawings, this beautifully illustrated book serves as a wonderful introduction to these royal monuments. This straightforward text explains the history and significance not only of the famous Sphinx and the Pyramids of Giza—the emblems and legacy of the powerful Fourth Dynasty—but also of the lesser-known tombs that stretch from Saqqara to Meidum and Dahshur. 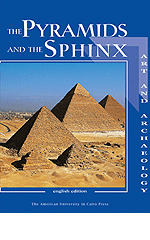 The Pyramids and the Sphinx draws on the most recent archaeological findings to lead the reader on a discovery of the most fascinating aspects of Egyptian civilization. Here, too, are the pharaohs who ordered the pyramids’ construction, the treasures found in the most famous tombs, and the men who revealed their secrets. Combining majestic aerial shots with close-up photographs of interior artwork and statuary, this guide offers a close look at some of the most impressive monuments in human history. Also available in French, German, Italian, Russian, and Spanish.